The ALS Association is the only ALS non-profit organization to support people with ALS on every front — care services, research and advocacy. Find out how money raised by Walk teams all over the country positively impact these important mission priorities. 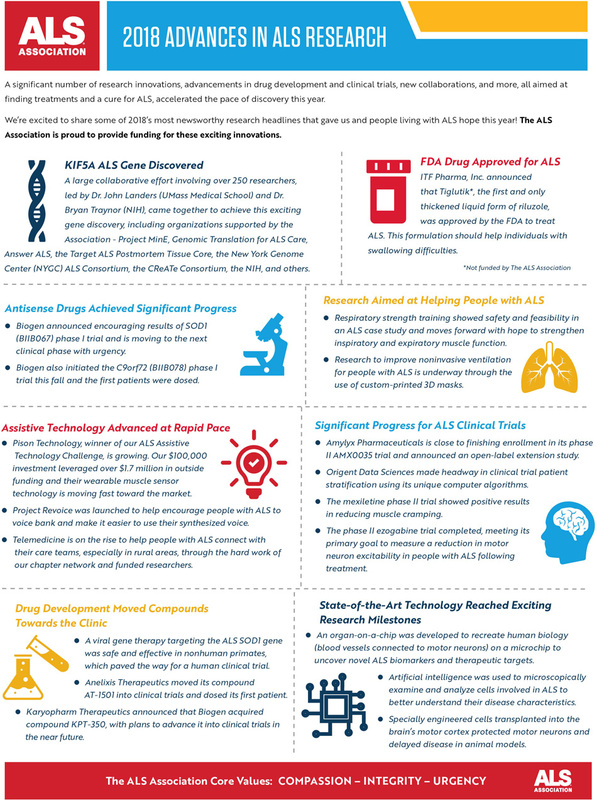 With your support, The ALS Association’s collaborative and global approach to funding research continues to lead to significant discoveries by top ALS scientists all around the globe. With the world’s largest ALS non-profit research program, The Association is currently active in more than 150 laboratories across the globe. In The Association’s history since 1985, we have committed over $128 million to research. Due to the huge funding boost from generous donors during the ALS Ice Bucket Challenge (IBC), so far we have committed over $84 million to research alone, not including investments in the other core pillars of The Association. We feel privileged with this great responsibility to spend these dollars wisely, transparently and in ways that make the most impact on the fight against this disease. We are committed to maximizing all donations from the ALS IBC and beyond by partnering with other organizations to fund research, along with tremendous efforts by our ALS advocates and volunteers across the country. It is important to keep up the momentum to contribute to funding the most promising ALS research all over the world!